It is the broad, flattened, sinuous ridge creates the upper boundary of the ilium. 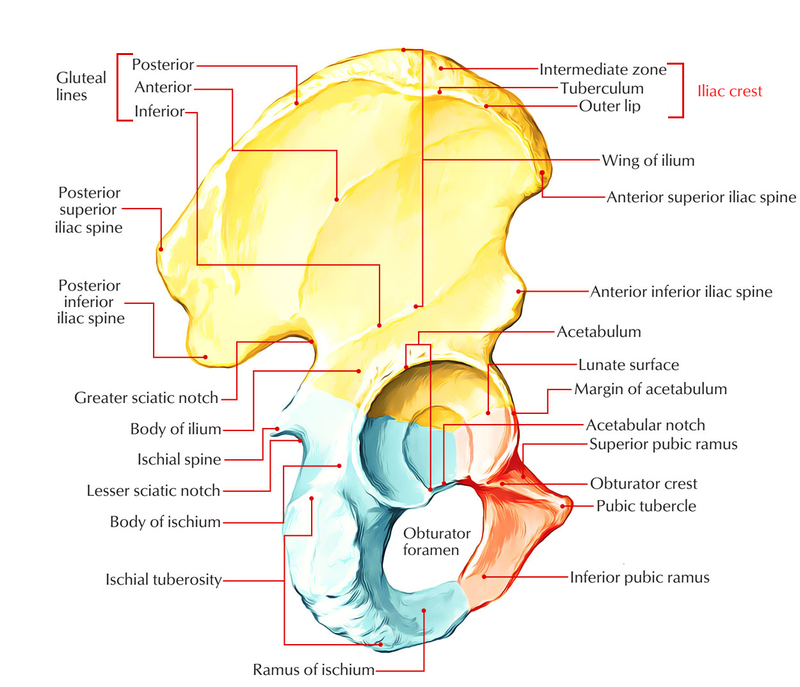 The highest point of iliac crest is located at the level of intervertebral disc in the middle of L3 and L4 vertebrae. Morphologically, the iliac crest is split into anterior two-third or ventral segment and posterior one-third or dorsal segment. The ventral segment presents an inner lip, an outer lip, and an intermediate area. The dorsal segment presents inner/medial and outer/lateral sloping surfaces. Anterior superior iliac spine is a bony projection located at the anterior end of iliac crest, which attaches to the lateral end of the inguinal ligament. At the lateral end of the fold of the groin the anterior superior iliac spine can be easily palpated. Posterior superior iliac spine is a bony projection located at the posterior end of iliac crest, which is situated at the level of spine of S2 vertebra and indicated superficially on the lower part of the back as a small dimple. The outer lip of iliac crest has a tubercle referred to as tubercle of the iliac crest, about 5 cm behind the anterior superior iliac spine. The iliac crest is subcutaneous and easily palpable. With the client prone, place your palpating fingers on the iliac crest and follow it as far anterior as possible. It ends at the anterior superior iliac spine (ASIS). Then follow the iliac crest posteriorly to the posterior superior iliac spine (PSIS). The following muscles attach onto the iliac crest: the latissimus dorsi, erector spinae group, quadratus lumborum, transversus abdominis, gluteus maximus, and tensor fasciae latae. In medicine, the iliac crest is a specifically important bone structure, due to large amounts of bone marrow that it has. For bone marrow transplant procedures, it is frequently used as a source of red bone marrow cells and stem cells. The iliac bone crest is usually considered to be a safer place to harvest bone marrow compared to the vertebrae in the spine. The quality of the bone marrow is generally considered same as spinal bone marrow that is extracted from this bone. Iliac crest syndrome, sometimes called the iliac crest pain syndrome is a disorder characterized by recurrent lower back pain. After sitting or standing in a particular position for a long time, the pain may occur specifically after exercise. Another symptom is one iliac bone crest is lower compared the other. Often, the main cause is a swollen or torn iliolumbar ligament, the ligament that attaches the iliac bone crest to the spine. In some instances of hip iliac crest syndrome, an iliac crest fracture may be present. mThese fractures are usually treated conservatively. Generally, in a healthy adult it will heal naturally, although analgesia may be necessary. In bone marrow donors Iliac bone crest fractures are also sometimes found as a complication, at the times marrow has been extracted from the ilium.